Author: Patrick J. Dickens †. Edited by: Rainer Voßen, Megan Biesele. Series edited by: Rainer Voßen. 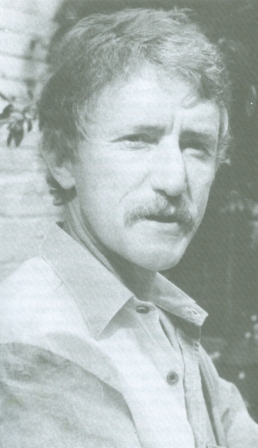 Between 1989 and 1992, Patrick Dickens learned Ju|’hoan, revised and streamlined its existing orthography – for practical use by native speakers and scholars – and used Jan Snyman’s Ju – Afrikaans dictionary (Snyman 1975) as basis for his English–Ju|’hoan / Ju|’hoan–English Dictionary (see link below). He wrote the present Grammar manuscript as part of the numerous curriculum materials he produced in typescript for teaching Ju|’hoan, until then an exclusively oral language written only by a handful of scholars. Dickens then used these materials to teach adult literacy and the first sixteen young Ju|’hoan people who would become primary teachers in the Nyae Nyae communities. This work, done under conditions of extreme remoteness and hardship, and in the knowledge that it would take the last years of his life, has had profound effects on Ju|’hoan cultural development. As an educational program for and with the Ju|’hoan in their own language, based on Dickens’ linguistic and pedagogical fieldwork, the VSP Village Schools Project was launched in 1991. It has continued much as he envisioned it up to the present. In September 2004, the VSP was incorporated into the national educational system of Namibia. Though it has experienced expectable political ups and downs through the first years of Namibian independence, the VSP has been seen as a model for a number of other educational efforts by indigenous peoples of southern Africa. It is particularly its combination of local-language promotion with an alternative, holistic approach to community education that has made it attractive to otherwise marginalized peoples who still value their own traditions. Hundreds of Ju|’hoan texts have since then been taped and translated and some have been linguistically interlinearized. These processes could not have taken place unless Dickens’ published Ju|’hoan orthography had been adopted at the outset by the Namibian government as well as by the Ju|’hoan communities. 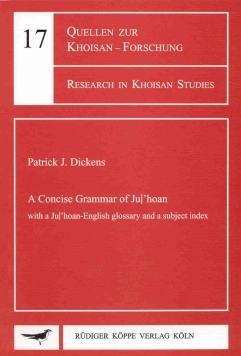 Following the links below, you will find a complementary dictionary of Ju|’hoan by Patrick J. Dickens (1953–1992) as well as an obituary paper collection in honour of the author. The posthumous publication of Dickens’ grammar on the North Khoisan language Ju/’hoan is a little jewel in the publication world on Khoisan languages. […] This small book is of value not only to Khoisanists and general linguists, but also to anthropologists and laymen interested in the nature of a “true” hunter-gatherer language. The book is simply fun to read.